I attended a 2-day workshop taught by artist, Leslie Gabrielse, along with 5 of my artist friends. I wanted to concentrate on faces. His way of working was amazing. The process begins like this; 1) backing of Crinolin (stiff, woven material for making hats); 2) thin batting on which you will pin your fabrics; 3) another layer of Crinolin over the top - it has your design drawn in pencil. You use the Crinolin as a guide for your design. All of his pieces are sewn by hand using #5 embroidery threads. 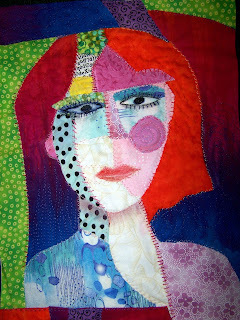 My piece is machine quilted and embroidered by hand...the best of both worlds. this is a very successful piece. is crinolin that stiff loose weave fabric similar to interfacing? I love it, Jamie! Great design and colors. I also wish I'd been there.